The worldwide provider of unified communication (UC) and fixed mobile convergence (FMC) technologies, MobileMax has launched the first mobile application for Google Voice – GVdialer (www.gvdialer.com), which allows users to call using their Google Voice account directly from their handsets, supporting iPhone, BlackBerry, Android, Windows Mobile and Nokia Symbian mobile devices. One number – Present your Google number as your Caller ID on outgoing mobile calls and keep your mobile number private. Simple calling – Dial directly from your phone’s contacts, speed dial, call log or keypad, and GVdialer automatically get you connected using Google Voice. Cost saving – Set your Google Number as a favorite number on your mobile plan, and stop paying for local and national long distance calls, thanks to Google’s low rates for international calls. Google Voice access – Get instant access to Google Voice features such as Voice mail, Inbox, GOOG-411 service. Customizable – GVdialer provides user the flexibility to configure when GV will be used – e.g., all calls, international calls, or decide on each and every call. The free trial version of GVdialer mobile application that lasts for 30 days is available and users can also download the full paid version for $9.99, including all future versions and features. 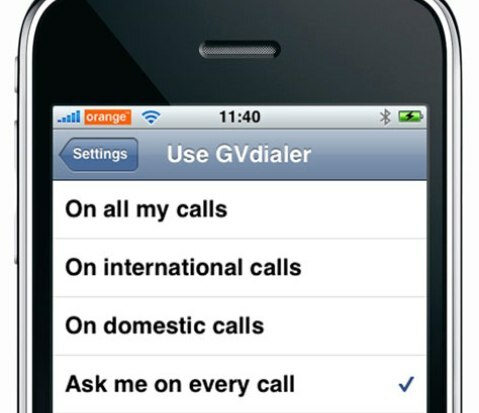 iPhone users can get the GVdialer mobile app that includes future updates for just $2.99 from Apple APP Store.